Well, to be honest, it’s been almost two months since I got back but have just been a little homesick and too lazy to do any serious blogging. First it was getting over the jet lag, and then it was cleaning and stocking a house that had been closed for a few weeks. Next came the back to school event! All in all, I had plenty of excuses to not start writing. But enough is enough. Hopefully, this was just something akin to a writer’s block, and this first post will help open the floodgates! Before beginning anything auspicious, we Hindu’s generally pray to Lord Ganesha. And since this a second beginning of sorts to my blogging, what better post than one associated with the festival that just passed us by – Ganesh Chaturthi! Mine is a Ganpati crazy family - be it my parents, sister or me - Ganpati Bappa happens to be our favorite God! Though I believe that there is one supreme power, all Gods are the same etc etc, when I close my eyes to count my blessings or ask for help, I envision the sweet elephant faced deity riding a mouse as my savior! Every time I go to Mumbai (which is every visit to India), I make it a point to visit the Siddhivinayak temple there. Whenever I see an elephant on the road, I feel thrilled, as though it is a sign of good things to come. Call me superstitious if you wish, but it is what it is! Everytime me or my sister would go on a picnic, fair, trip or any outing, we would purchase a Ganesha idol for our parents. We still do the same, but just not as often. I have lost count of the number of idols in different poses, styles and materials in my parents' house. My dad's brother deserves a special mention here. 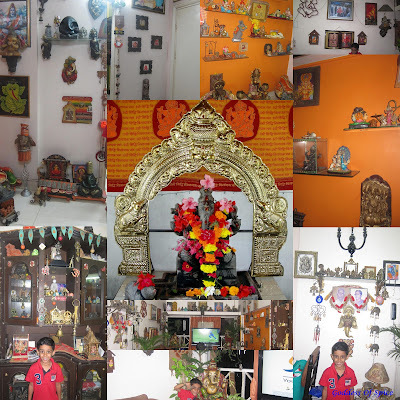 His house in Thane is a Ganesha museum in itself! Babu chitta, as I call him, opens it for the people to come and visit during the 10 days of festivities. He also has established a Ganesha temple at Badlapur. The picture below is a collage of some pictures taken at his house when we visited him last month. The image in the center is of the temple. Having grown up in such an atmosphere, is it any wonder that Ganesh Chaturthi is my favorite festival? As a kid, I remember seeing the huge Ganesha idols being decorated and readied for Ganeshotsav in Mumbai. I have lived in quite a few places in India (my dad had a transferable job), but the pomp and gaiety of that city does not match any other city that I have seen, as far as this festival is concerned. My school was at RCF colony, Chembur and while going home in the school bus we would get to see the preparations being done at RK studios and Dukes. On the day of the sthapna (installation of the idol at the place of worship) the streets would be crowded with people dancing in processions around huge trucks that would bring the idols to the pandal. The pandals would be decorated with lights and garlands. Over the years, the competition at various madals has grown stronger and there are huge investments. A lot of current affairs and political themes are being incorporated. Lal Baugcha Raja is reportedly the most visited mandal in Mumbai! Not to be outdone, each residential building or society also usually has their own idol. The size of the idol, the decorations, the theme – everything is a cause for rivalry! There is even competition as to who bursts the most crackers! Remember the 5000 and 10000 ki ladiyaan anyone?? For the 10 days, there is an air of festivity and excitement. At home also, we would get a small clay idol. Usually people offer prasad and prayers to the Lord for the 10 days. Then on the day of the Visarjan, the idol is carried in processions, accompanied by loud music and dancing as well as bursting of fire crackers, to the sea/river and immersed in it. Shouts of “गणपति बाप्पा मोर्य, पुड्च्या वर्षी लौकर या” rent the air. It is with bitter sad feelings that we say good bye to Ganeshji and pray for him to come back soon the next year. Usually I just do pooja on Ganesh Chaturthi every year and prepare kozhakattais. But this year, I got a chance to share in this awesome atmosphere even here in the US thanks to a couple of friends who bring home Bappa every year. It was wonderful to attend aarti in the evening and gorge on modaks. My son also got a taste of Ganeshotsav for the first time! He even learnt a new rhyme – “Twinkle twinkle little star, Ganpati Bappa Superstar!” chanted the kids :). In fact he insists on listening to “सुख करता दुःख हरता” every evening when I light the lamp in front of God! Thank you dear friends for the wonderful darshan! Piu. Glad that you are back!!!! Look forward to your posts!!!! Hey Dilpi, thanks dear - if that doesn't motivate me to be regular with my postings, I don't know what will!